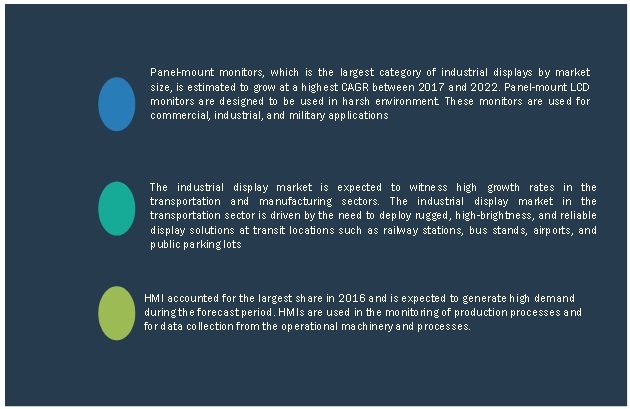 [186 Pages Report] The industrial display market was valued at USD 4.09 billion in 2016 and is estimated to reach USD 5.87 billion by 2022, at a CAGR of 6.18% during the forecast period. The base year used for this study is 2016, and the forecast period considered is between 2017 and 2022. Industrial display devices use various technologies such as LED, LCD, OLED, and others that drive the electronics sectors. In the industrial sector, industrial displays are used in various fields such as automotive, oil & gas, and pharmaceuticals. They are used in many industrial applications such as industrial touchscreen monitors, digital signage, and interactive display systems. The industrial display market witnessed significant technological advancements in the past decade. The traditional display devices that are based on cathode ray tube (CRT) technology were bulky and space-consuming, hence, it could not meet the requirements of the industrial applications. Eventually, display devices evolved from being bulky and space-consuming to slim and have a thin bezel. These display devices now come with various advance features such as high resolution, durability, environmental stability, readability, wide temperature range, rugged, improved contrast ratio, higher display brightness, and low-power consumption. This has led the development of industrial displays which are suitable for industries such as oil & gas, mining, power generation, food & beverages, pharmaceuticals, and chemicals where the environment is hazardous and catastrophic. High competition in the industrial display market has led to the development and launch of products with high-end specifications. Note 2: “Others” include VPs, directors, and other senior-level executives of the companies. The industrial display market ecosystem includes industrial display manufacturers and solutions providers such as Samsung Display Co., Ltd. (South Korea), LG Display Co., Ltd. (South Korea), Panasonic Corporation (Japan), Advantech Co., Ltd. (Taiwan), and NEC Display Solutions (Japan) who offer display solutions to industrial applications. In February 2017, Samsung Display announced a SMART signage line-up that includes the quantum dot light-emitting diode (QLED) signage ultra-high-definition (UHD) displays and fine pixel pitch IF Series LED signage. The QLED signage UHD displays (55" and 65" models) have an extensive and detailed viewing feature. In January 2017, LG launched 55" FHD transparent OLED displays, 77" UHD double-sided OLED displays, and pillar-type commercial displays that combine six 77" UHD OLED panels. 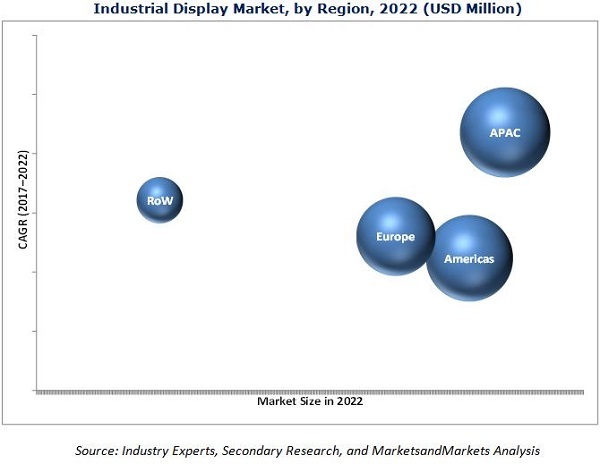 The industrial display market was valued at USD 4.09 billion in 2016 and is expected to reach USD 5.87 billion by 2022, at a CAGR of 6.18% during the forecast period. The factors such as , rising demand for HMI devices, high growth of LED-backlit LCD-based display solutions, and growing adoption of IoT are expected to drive the growth of this market. The scope of this report covers the industrial display market on the basis of type, technology, panel size, application, vertical, and geography. Panel-mount monitors held the largest market size in 2016. Panel-mount monitors are widely used for in industrial applications for displaying various parameters including the current production status, equipment uptime, and inventory levels. The LCD technology accounted for the largest share of the overall industrial display market in 2016. Products such flat-panel displays, desktop monitors, industrial PCs, and some video walls are using LCD technology. This is responsible for driving this market. The products with panel size range of 14–21" held the largest market for industrial displays in 2016. These include terminal monitors, public signage, and digital displays. The HMI application accounted for the largest market size for industrial displays. HMIs are especially significant in the oil & gas industry where understanding rough ambient conditions, extreme temperatures, a high degree of pollution and operation is not only a key primarily to safety but also to improving profitability. The manufacturing vertical accounted for the largest share of the overall industrial display market in 2016. HMIs and industrial PCs that used in the manufacturing industry drives the industrial display market. Rapid industrialization, infrastructural development, and integration of advanced technologies by various industries, the demand for energy & power are increasing worldwide. High demand for energy can be achieved by more stabilized electricity production that requires higher plant performance and flexibility. This enables the plant operator to monitor and control the plant more efficiently. Various industrial displays such as HMIs, industrial PCs, and video walls are widely used for power generation in power plants such as thermal, hydro, nuclear, and solar. Industrial displays such as HMIs and industrial PCs connect many energy systems and are used for data acquisition, energy measurement, and instigating procedures to enhance the production of energy. Industrial displays assist customers to make reservations, find out the prices of tickets, get schedules of arrival and departure, and receive updates on current service status of reservation in the transportation sector. Also, they enable wayfinding for travelers and advertise brands, permitting the provider to quickly and efficiently communicate to the customer the requirements for traveling. In the transportation sector, signage systems are usually integrated with many different technologies that can retain information about schedules and reservations on a real-time basis. Industrial products for the transportation sector are industrial digital signage, public information industrial displays, and industrial kiosks, among others. These industrial displays are used in transportation vertical such as in train, buses, roads, and airports. It also used for system control, entertainment, cockpit for navigation, advertising, and others. Who are the major current and potential competitors in industrial display market and what are their strategies, and developments? What opportunities open frame monitors offers in the industrial display market? North America held the largest market size for industrial displays in 2016. The region has strong demand for display technologies and automation solutions from manufacturing, and oil & gas verticals. The key restraining factor for the growth of the industrial display market is high costs pertaining to the acquisition and implementation of industrial displays. This report describes the drivers, restraints, opportunities, and challenges pertaining to the industrial display market. 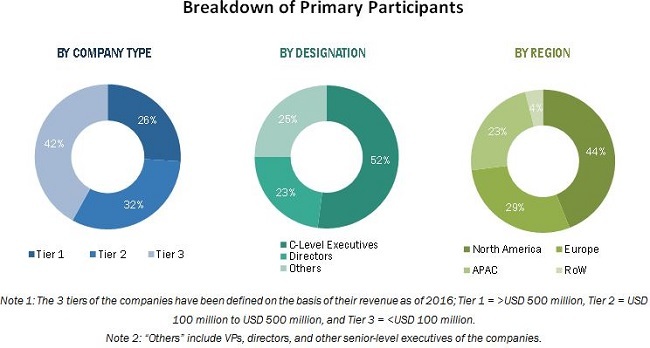 In addition, it analyzes the current scenario and forecasts the market till 2022, including the market segmentation based on type, technology, panel size, application, vertical, and geography. Some of the key players present in this market are Samsung Display Co., Ltd. (South Korea), LG Display Co., Ltd. (South Korea), and Planar Systems, Inc. (US), NEC Display Solutions (Japan), and Advantech, Inc. (US). 14.3 LG Display Co., Ltd.
14.5 NEC Display Solutions Ltd.